Love these pants!! And it looks so great with the denim jacket! You are wearing these well girl! Totally in love with the print! Great pants and I love that denim jacket! I've been looking for a light wash one for summer! Uuuuh, I juust got the same pants! Love at first sight, right? Those pants rock. I love them. These pants are amazing, and I love the length of this denim jacket! Those pants are stunning! What nail polish are you wearing? I love it! I really love that bag and the yellow nails! Wish I could pull off printed pants! 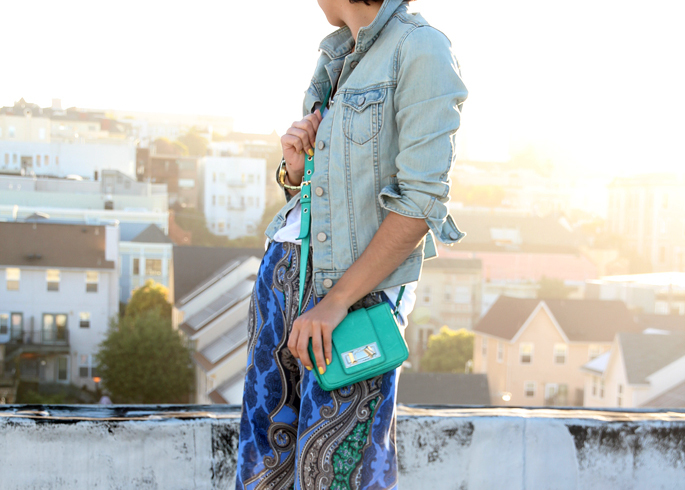 Those printed pants are perfect! silk pants are as comfortable as sweats but yet oh so classy! i'm jealous! so simple, comfortable, and incredibly chic! Love! Comfy and fancy! You look stunning! Very beautiful pants! Look awesome with a jean jacket! I love those pants!! and the jean jacket was a perfect topper- and I'm sure the BF prefers it!! Lo que más me gusta del outfit es la mezcla del azul klein con el mint. I LOVE THE KLEIN & MINT MIX! Love this, those pants are amazing! You pull off those chic pants so flawlessly! Such a mesmerizing look. 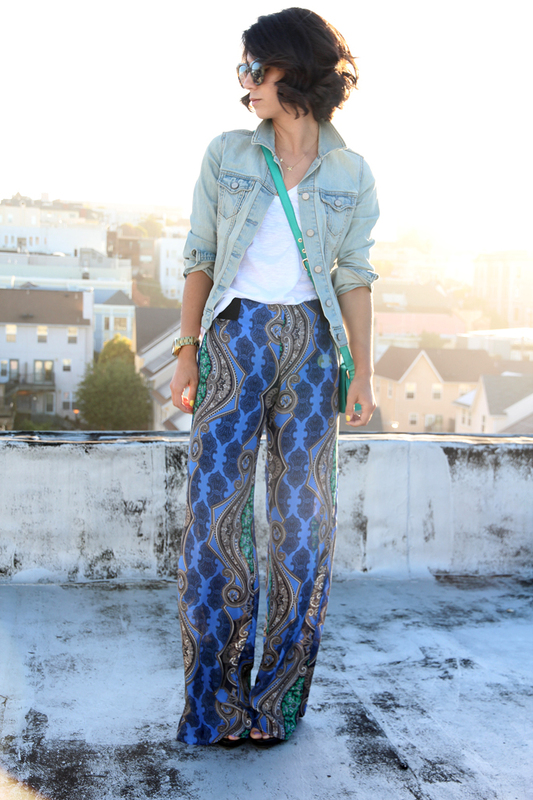 I love the mix of the silk pants and heavy denim! Wondering if old navy still has that cute jacket!? Love the pants, so much fun! great post! like always..i really love your blog! Love the pants, the print is really cool. Killer print and the backdrop to these shots is just beautiful! I love these colors Krystal and definitely love the color of the purse! I need to buy printed pants but I get so nervous when I bring them home! Ha! AMAZING pants! love the everything about the colors! Those pants are amazing...wish I could pull those off! Genius pants! The print is beautiful - it really plays up the simplicity and ease of the other pieces. Those pants are fabulous!! Also love the pop of bright colors with your bag and nail polish. What an awesome print. You look great! SO chic and easy! Great color combinations! So summer! Awesome pants, love it. fun outfit! completely obsessed with the color of that bag! Ohmygoodnes those pants are AMAZING. So fun. I LOVE THE PANTS! AMAZING OUTFIT! Adore! I have similar pallazzo pants and I can't wait to style them! Those photos are gorgeous! Love the outfit and the lighting. I love a denim jacket with anything! comfy and chic! My two favorite categories! You're so happening with your collar popped like that. The print of these pants is amazing. I wore a look so like this last week (not blogged it yet though) - your style must be rubbing off on me ;) Naturally, I love it! Kind of obsessed with this whole look.